Miami Art Basel exemplifies the most colourful of micro-migrations the art world has ever seen, with a melting pot of cultural gamechangers showcasing their works each year – including Alexandra Marzella, Matt Sukkar and Sarah Kinlaw, to name a handful. In the video below, LA-born, New York-based photographer-filmmaker Emmanuel Olunkwa – who most recently went head-to-head with BFF Amandla Stenberg in a much-needed discussion on the difficulties of being a ‘minority’ in the art and fashion worlds – documents his first time at Basel. Uncovering some of the intriguing acts to sprout out of this year’s crop, India Salvor Menuez – who curated “Booklub 9”, hosted at the Baby’s All Right pop-up show Baby’s All Basel – was also on hand to explain the sometimes-mysterious, raw medium of performance art. "The way Miami shifts to accommodate Art Basel is what interests me the most. The culture and the people it attracts is unlike anything I have witnessed. It was a conglomerate of art and business people, and socialites networking – it is truly bizarre," Olunkwa explains. "Recently I have been really drawn to creating more video work and including performative elements. 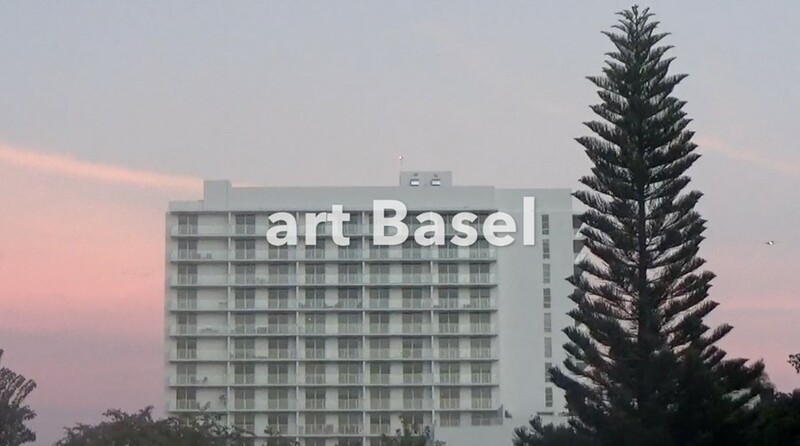 In this video, ‘Art Basel’, I thought it was important to present the footage in the way that I experienced the show. I am not keen on artwork that privileges a certain class or education – I am most interested in provoking a feeling or memory. Performance art demands that the audience participate and does not allow for anyone to be submissive."